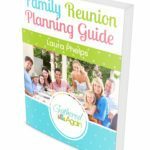 Are you wondering what to buy for your brother’s birthday or Christmas? Why wouldn’t you want to get a great gift for the guy that made your life so difficult those first couple of decades? 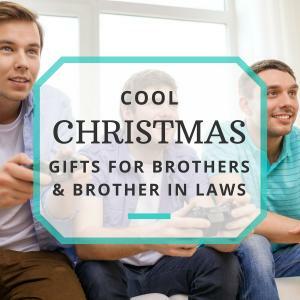 Brothers come in all shapes and sizes and this gift list is bound to fit at least one part of your brother’s multiple personalities. 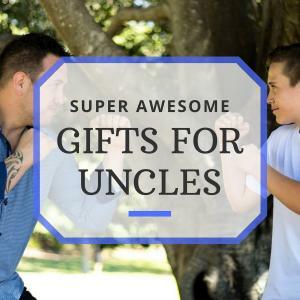 I have amazing gift ideas for brothers who are geeky. You know, the one who secretly dresses in Starfleet uniforms. There are also foodie gift ideas for brothers who practice Gordon Ramsay impressions when no one is looking, classy gift ideas for brothers who actually use the word “penultimate”, manly gifts for brothers who are willing to build you a house and funny gift ideas for brothers who can make you laugh- even when the time is completely inappropriate. Please note that any links to products in this article are only to products that we own or gave to others as gifts. Back in the day, being geeky was a bad thing, but the world has finally embraced their inner geek. “Geeky” is now worn as a badge of honor, and your brother lets his geeky flag fly. 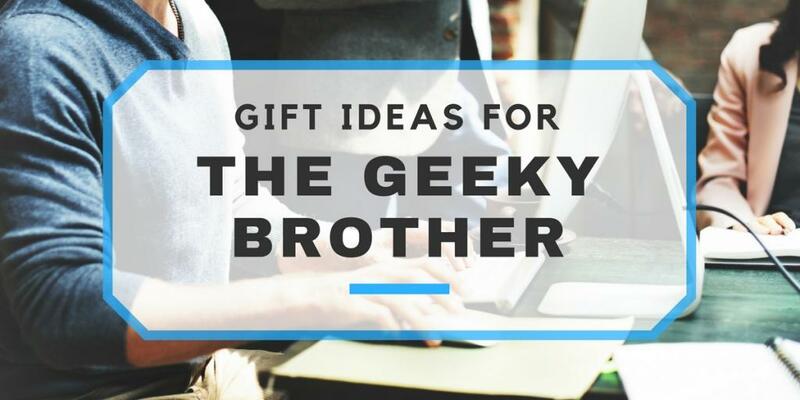 But, you knew your brother before being geeky was cool, and we’re happy to help you remind him of that. Below are some excellent geek gift ideas for brothers. Geek Dad Book: Is your brother also a dad? Then this book will help him pass the torch of his geekiness on to his kids! My husband has this book and it’s full of cute projects like making “fireflies” from LEDs. This is a really great way to spend some time with the kiddos. Bamboo Wireless Keyboard: Not only is it environmentally friendly, but I just love the idea of feeling the smooth texture of bamboo. Now, your brother will hack the world in luxurious comfort. Blue Screen of Death T-Shirt: All who have used the Windows operating system have experienced the agony of the blue screen of death. Now your brother can remind people of that pain anytime he enters the room. R2-D2 Car Charger: I gave this to my brother and he loves it. Now your brother can drive in style with R2-D2 by his side with this Star Wars car charger. This was a great birthday gift idea for him. This is the droid you’re looking for. Star Trek Inspired Captain’s Log: Now your brother can record his daily accomplishments in his very own captain’s log. The Star Date at the time of this writing is 94562.39. Funny Science Geek Periodic Table Pun Shirt: I’m a sucker for puns, and this shirt does not disappoint! 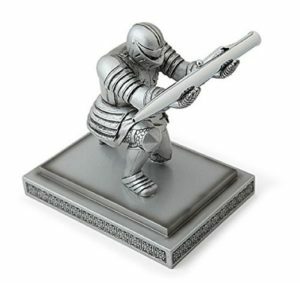 Executive Knight Pen Holder: Honor thy brother with this pen holder which has a knight respectfully presenting his highness with a pen. Truly, a gift that will remind your geeky brother that he is a king among men. Flux Capacitor Car Charger: My husband has this in his car and thinks it’s the coolest thing. It lights up just like in the Back to the Future movie series and has a charging port for his cell phone. That’s the power of love! Does your brother love everything food, including cooking it? 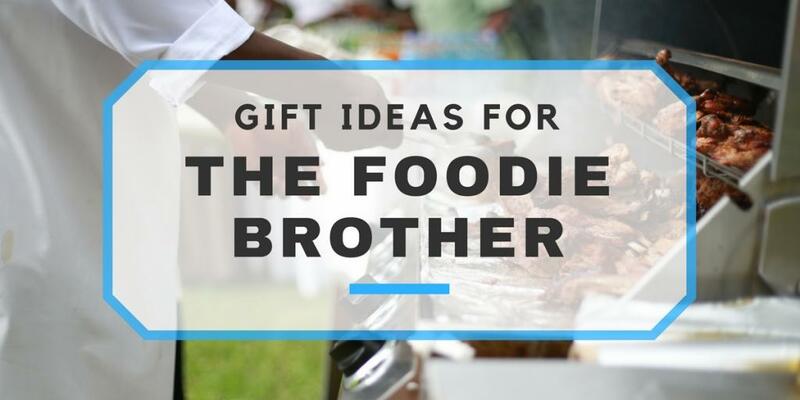 These foodie gift ideas for brothers who love cooking, making or eating food will help your brother advance his culinary skills. I also include a few tools that are simply great tools every cook should have! Cast Iron Skillet: Nothing cooks like cast iron and a high-quality cast iron skillet is the perfect introduction to cast iron cooking. Just remember to tell your brother to “season” it after cleaning it! Meat Grinder: An actual meat grinder like this one is an excellent step up from the normal ones found at stores or those Kitchen Aid attachments. If your brother is interested at all in grinding his own meat or making his own sausage, then this meat grinder will over joy him! This is almost exactly the same as the one my husband has, but it looks like they’ve updated the model a bit. Beer Brewing Kit: What brother doesn’t love an ice cold beer? Help your brother on his journey to being a master brewer by getting him his first beer making kit. This is the kind of gift that keeps on giving! Molecular Gastronomy Kit: Molecular Gastronomy is what happens when genius and madness decide to make food together. Do you ever eat lemon foam or tzatzki spheres? Yeah, me neither, but with this kit, your brother can turn his kitchen into a laboratory! The Art of Fermentation: Fermentation is the magic that brings us bread, wine, cheese and sauerkraut. This book, which my husband loved, explores the history as well as the how-to on fermenting nearly any type of food. 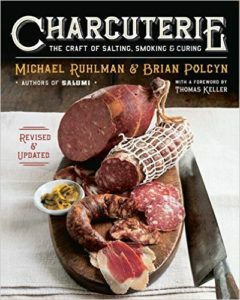 Charcuterie: The Craft of Salting, Smoking, and Curing: Do you like sausage, salami, duck confit or pates? If so, then you are a fan of Charcuterie! This book will help your brother on his way to the delicious preservation of meat! My husband has this book as well. When you were younger, you probably never thought your brother would be the classy gent he is today. That’s OK, you can still beat him at his own game by out-classing him with your exemplary gift-giving. 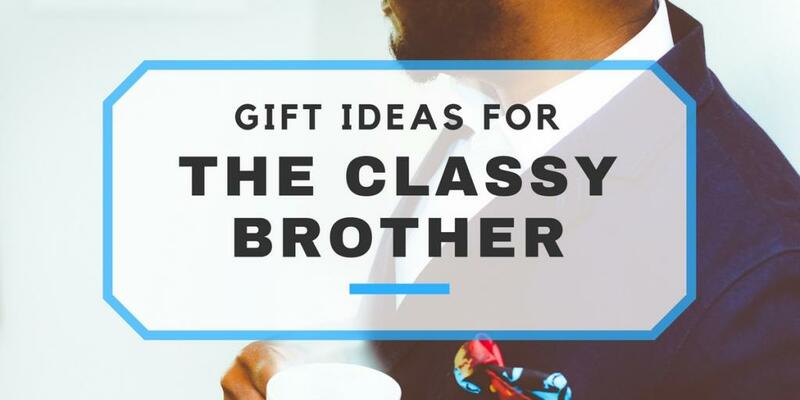 Below are some classy gift ideas for brothers who might possibly be the most sophisticated sibling you know. Wine making kit: Some men enjoy a good glass of wine while others enjoy it more if they made it themselves. Get him this wine making kit so that he can make his own, one gallon at a time! Nice Leather RFID-Blocking Wallet: This is a fantastic cross between classic and contemporary. You get a really classy looking wallet that also blocks RFID readers which can steal card information. 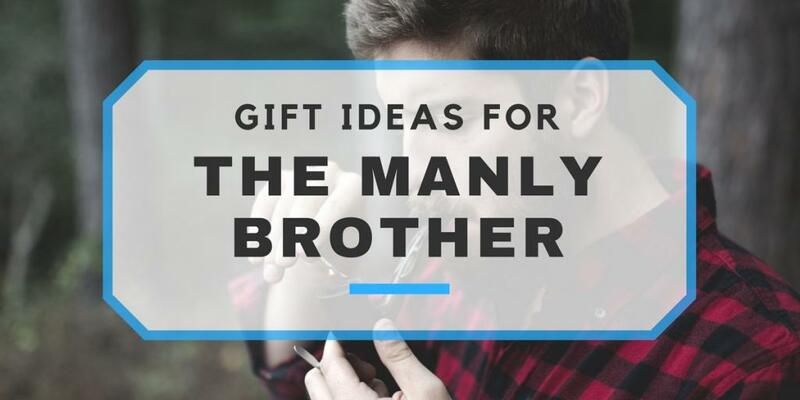 This classy yet sensible gift is perfect for your brother. Antique leather journal: Writing is healthy and good for the soul, and everyone should have a nice journal to write in as they please. For a brother, you will probably want to go with something more masculine, such as a brown leather journal with an antique appearance! A Handcrafted Pen: A pen isn’t just a pen after you’ve held one of such high quality. Give the classy gift of a handcrafted pen made by an artisan with passion. Leather messenger bag: If your brother is a student or a businessman, he can certainly get a lot of use out of a stylish and masculine messenger bag! Maybe he’s just trying to live up to Dad’s image, or maybe he is inspired by super heroes on TV, but your brother turned out to be a pretty manly dude. That doesn’t mean you can’t match his brawn with your brain. Below are great gift ideas for the brother who may have actually chopped a tree down by looking at it in a threatening manner. Morakniv Companion Fixed Blade Carbon Steel Knife: My husband has this knife and is so impressed with how high quality it is for the price. It is extremely sharp. The sheath it comes with, while plastic, is very high quality and has a very nice feel to it. 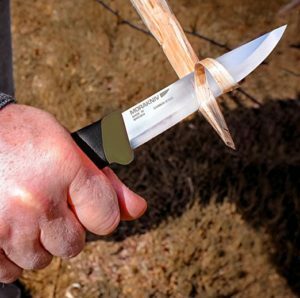 For under $15 bucks, you won’t find a better knife than this Swedish made one. 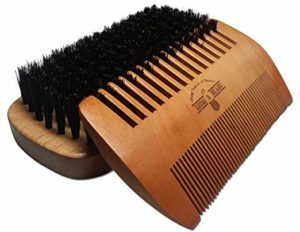 Beard Comb Set: My husband uses this beard comb set and loves it. He has commented numerous times how nice the bristles on the brush are. They are strong enough to get through his beard without scratching at his face too much. The wooden comb that comes with it is just lovely. Flint and Steel Set: You can find these all day long on Etsy and they are perfect for the outdoors man who wants to do things the old school way. With a bit of char cloth and a flint and steel, your brother will make fire like it’s year 899! Yes, my husband has one of these as well. Straight Shaving Razor: I can’t speak personally about shaving my face, but I’ve heard that straight razors give the closest shave possible. Not to mention, your brother will look really cool while doing it. Quality Tools: Quality tools last a lifetime and there’s nothing better than a tool that feels perfect in your hand. I once bought my brother a really nice tape measure, and for years after, any time he used it, he would say “man, this is a nice tape measure.” He experiences pride every time he uses it. This is definitely one of the more useful birthday gifts for men. Leather Tool Pouch: Tool pouches are useful in the garden, but they’re also useful in work around the house. I’ve watched my husband, father and brother all use multiple tools when fixing things, but there’s one difference. My husband has a leather tool pouch that he uses to hold everything doing a project. My husband has owned his for over 10 years and it saves him a lot of time! Solo Stove Titan Camping Stove: Solo Stoves are cool, little, camping stoves. They are very compact and super efficient. You basically fill them up with leaves, twigs and sticks, then set it on fire. They are really easy to use and quite convenient. 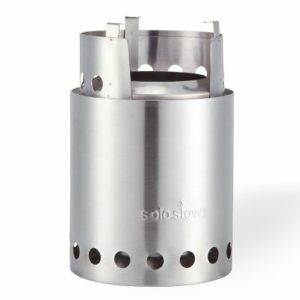 Solo stove makes a number of sizes. We own the “Campfire” version and the next size down called the “Titan.” The Campfire is perfect for making s’mores with the kids or roasting hot dogs! Does your brother have a way with words that brings a whole room to tears? In a good way of course! 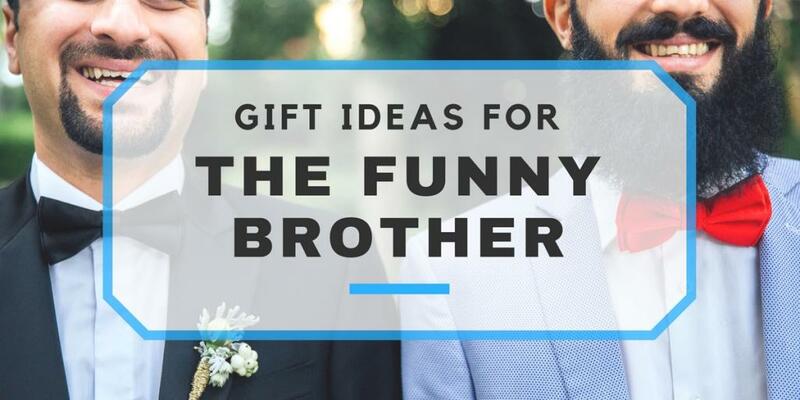 If you have a brother who makes peoples’ stomachs hurt from laughter, then we’ve got great gift ideas for you. 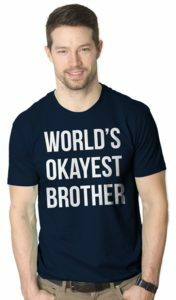 World’s Okayest Brother T-Shirt: My husband received this from his sister and this shirt is one of the funniest I’ve seen. We also enjoy when we’re in public and get random laughs from strangers. One time, he went into a gas station and all of the clerks at the counter laughed because of it. 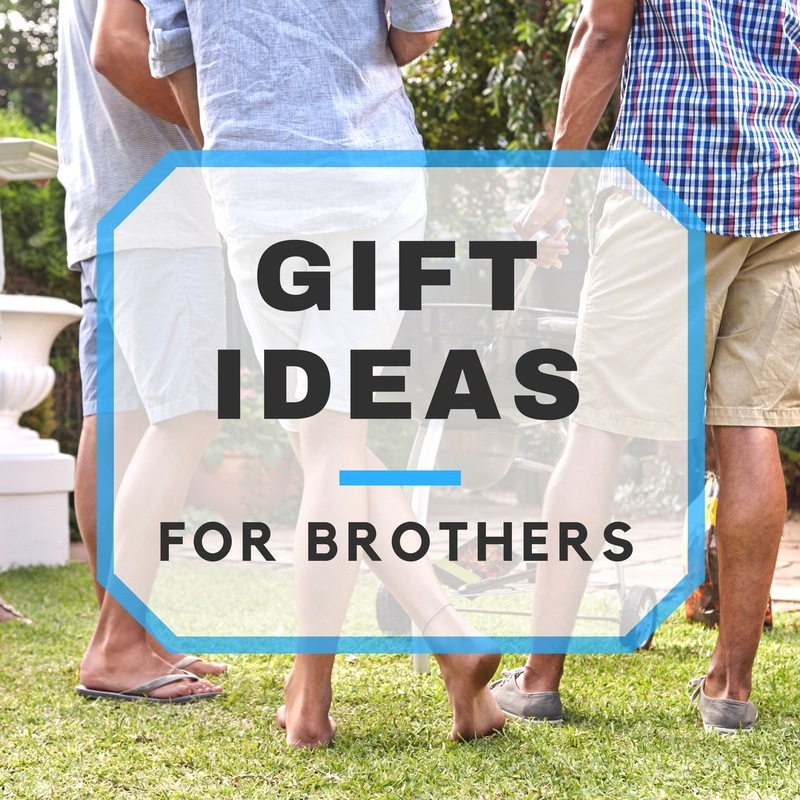 When it comes to funny gift ideas for brothers, this one might be my favorite. 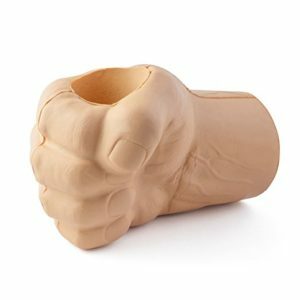 The Beast Giant Fist Shaped Drink Kooler: We don’t own this, but I lost it when I saw it. I don’t know why, but I would just love to see someone using this in public. Bad Taxidermy Book: My husband also received this book from his sister and it’s creepy to say the least. It is literally a book full of pictures of really poor quality taxidermy. This gift is really random, but we all laughed when he opened it. I can’t say that he has referenced it since, though. 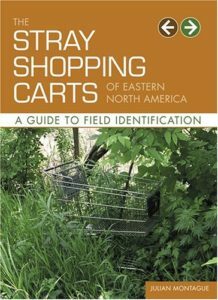 The Stray Shopping Carts of Eastern North America: A Guide to Field Identification: I saw the cover of this book and had to add it to this list. I don’t know if it is good, but you must see the cover of this book. National Lampoons Official Moose Mugs: If you grew up with the National Lampoon’s Christmas Vacation movie like I did, then these mugs need no introduction. These mugs are as amazing as they are completely impractical. Take up a copious amount of your brother’s cupboard space with this gift. Poo-Pourri Master Crapsman: I feel awfully low-brow admitting that I find this funny, but the people at Poo-Pourri know what they’re doing. It’s a gag gift that people will secretly use. 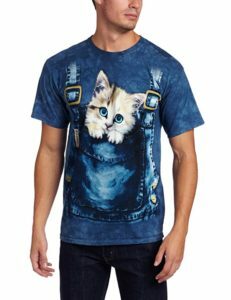 Kitty Overalls Shirt: This shirt is just amazing. 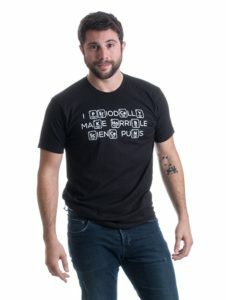 Any man who walks around with this shirt on and a straight face is a master of comedy. Exploding Kittens Family Card Game: I’m not sure I can describe this, so here’s a video. It’s a pretty funny game. No matter what your brother’s interests are, this list has something that will give him a smile. These ideas provide a great foundation for your own ideas. 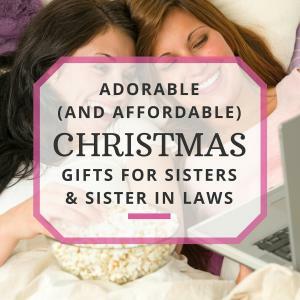 I hope this list has helped you find the perfect gift for your brother.